On an image reminiscent of the one Huawei posted last week of the notchless Nova 4 smartphone, the company posted a second with a release date and a clearer image than ever of the camera cutout. According to the teaser image, the device is scheduled to be released on December 17, and the display design looks strikingly similar to the recent leaks of the upcoming Galaxy S10 which features what the company calls an ‘Infinity O' display. One difference is that Samsung's front-facing camera is expected to be in the upper right-hand corner whereas the Nova 4's is on the top left. As consumers become more and more opposed to a notch design complaint about that of the Google Pixel 3 continue to pour out -- this camera cutout alternative could render a notch completely unnecessary and allow the bezels to be virtually absent. 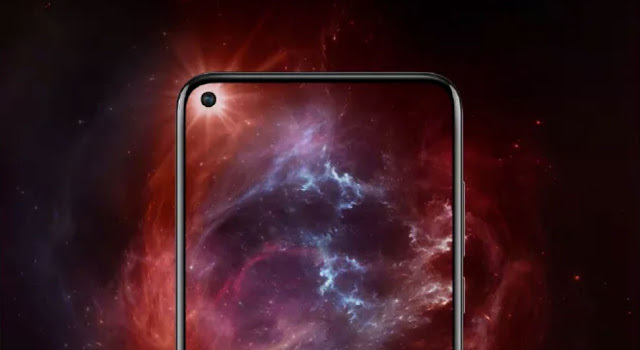 Huawei sent out invites for the launch of the rumoured Nova 4 with a display hole on December 17. Some fresh reports have now spotted a Samsung invite for a launch event on December 10. The invite shows an outline of what is likely the Galaxy A8s with the much talked about the Infinity-O display and a tagline that reads "Realm Galaxy". The invite clearly shows the small punch hole-style hole on the top left corner that will house a selfie camera. The Infinity-O display that Samsung is working on will offer a hole within the display rather than a traditional notch on the top of the display. This Infinity-O display will first come to the Galaxy A8s before it shows up on the Galaxy S10 flagship. Meanwhile, Huawei is also working on a similar display panel with a hole for the selfie camera, although we are unsure what the company is calling this display. Notably, the LCD panels on both the Galaxy A8s and the Nova 4 are made by BOE. As per past reports, the Galaxy A8s will get a 6.39-inch screen and will be powered by a Snapdragon 710 chipset coupled with up to 6GB of RAM. The Galaxy A8s is also tipped to house a 3,400mAh battery. The Galaxy A8s is also expected to be the second Samsung phone after Galaxy A7 to sport a triple rear camera system. This system is said to include a 25MP + 5MP + 10MP configuration, but the nature of the sensors are still unknown.